Valentine’s day… such a quick little holiday. To decorate or not? To be honest in the past I have put out a little candy dish and that’s about all. Now that I have a kid in the house, I want to be more festive, but I don’t really want to spend a lot of money. Ok, I never want to spend a lot of money. So as I was Pinteresting the other day… (I can use that as a verb right? Even though only my two fingers are moving as I scroll down through the pins?) Anyway, here are the pins that were inspiring me. (Click here for the links: 1, 2, 3, 4) I loved the natural colors and deep red. 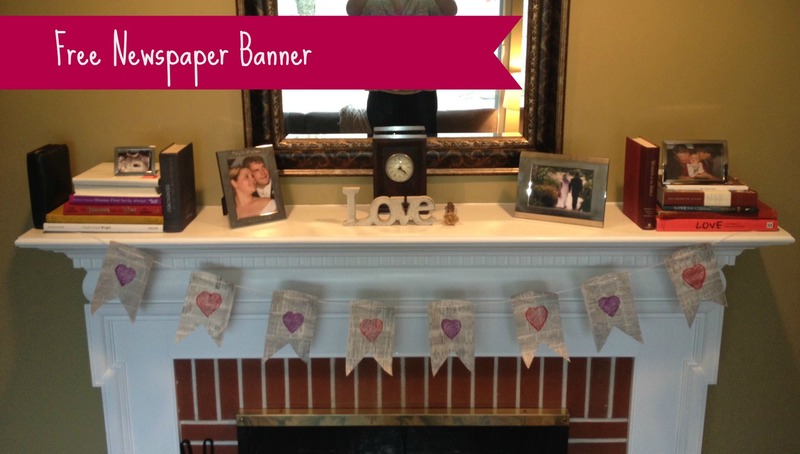 Also oved the burlap and especially the sewn hearts! 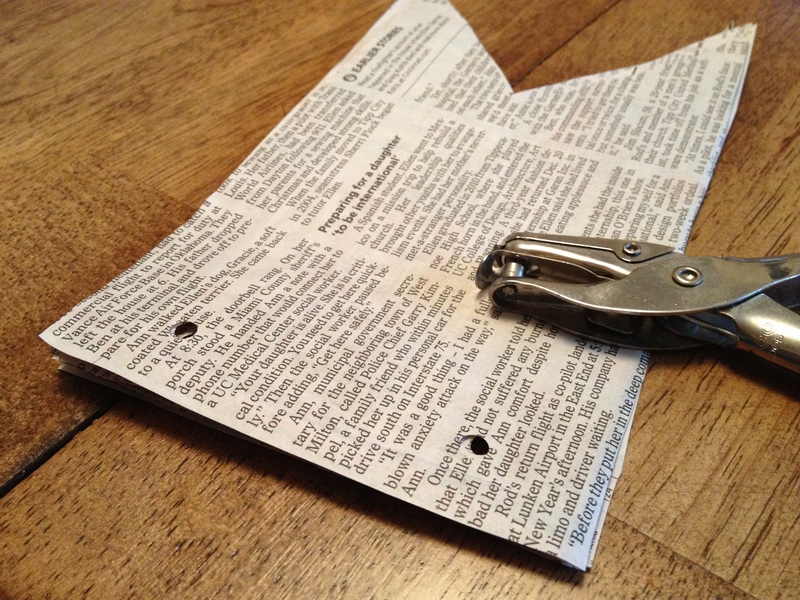 But, let’s be honest, I don’t have a sewing machine and I was trying NOT to buy supplies. The book pages were so clever, and they had me wishing I had picked up some old books while at St. Vincent DePaul for the Young House Love Macklemore Thrift Shop Challenge. 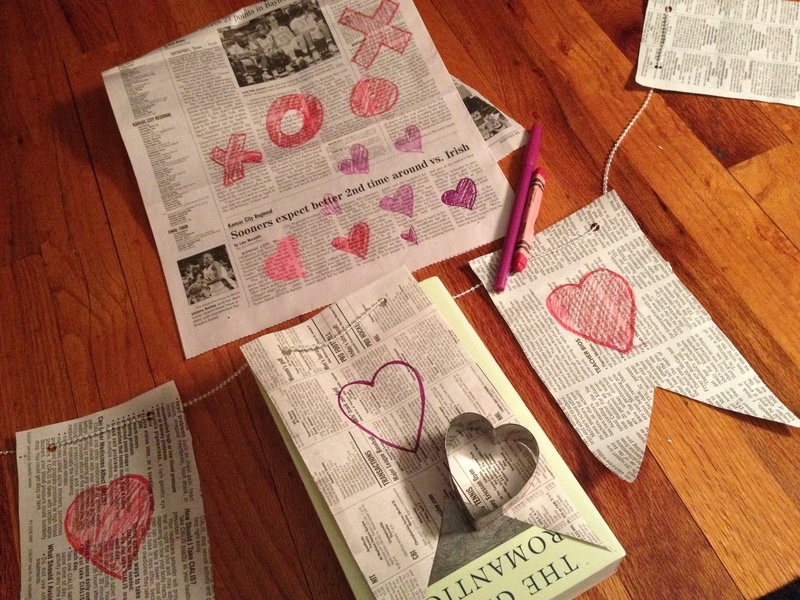 I was not about to rip up my books for Valentine’s Day. We heart books here at Schraeradise (#seewhatididthere). So, to stay on my budget of $0, I thought I might try to fashion something similar. I started with newspaper. I cut out a shape that I thought would work for the banner. I really just eye-balled it, figuring that I had a whole paper to work with if I messed it up. I did check the size with my mantle, tried to picture what it would look like… It had to hang high enough – higher than toddler hands could reach. The banner would stand no chnace against my Isaac George. 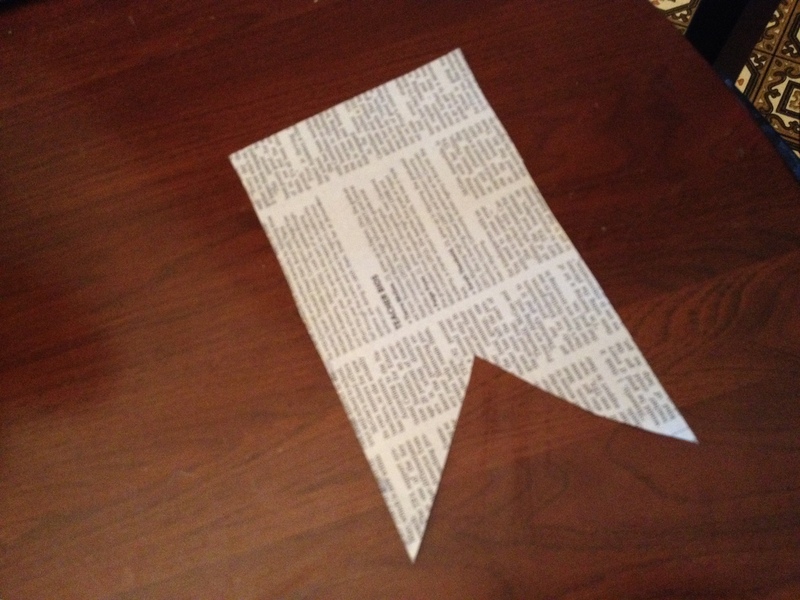 Looked good for me, so I cut out about 10 of these pennants and punched holes in them. Now, I just needed to figure out how to hang them. I had 2 options: A white ribbed ribbon leftover from gift wrap and a plastic pearly-ball chain like thing. I have no idea where I got the pearly chain, I have had it for years. After trying them both through the holes, I went for the pearls. It is like they found their Valentine Destiny (#friendsreference). 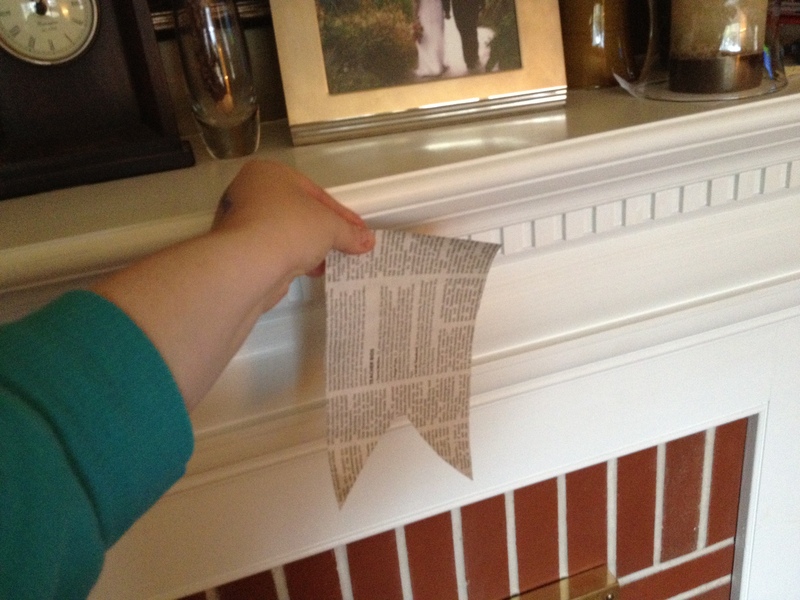 I thought they added a little bling to the newspaper and some texture against our painted wood mantel. I strung up 8 of the pennants and this is how it looked! Not bad at all. So this is where real life happens and the baby wakes up; I have to pause. It did give me a little time to contemplate what I would put on the banner. My first thought was X’s and O’s maybe mixed in with hearts. Then I thought of Isaac… at 17 months I thought hearts would be best. So later that night, after he was tucked in and hubby was asleep in the Lazyboy at 8:30 on a Friday night, I finished her up. I did have plans with my galfriend, but we decided to cancel, and I was challenged to do some things for myself. (Read about that here). So, I enjoyed a decaf and biscotti, then back to the banner! 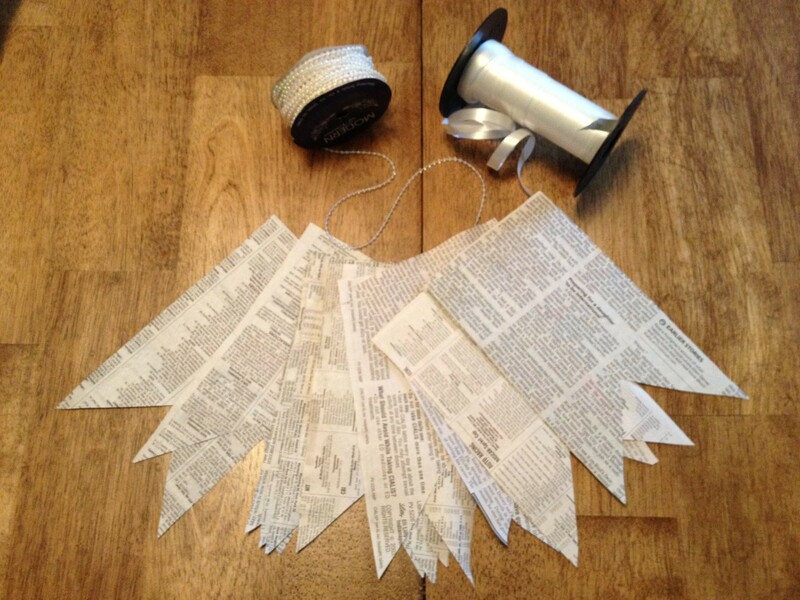 I originally was going to paint my hearts the newspaper, but because the paper was super thin, I thought it might make the paper buckle when it dried. So, I opted for the super easy answer! 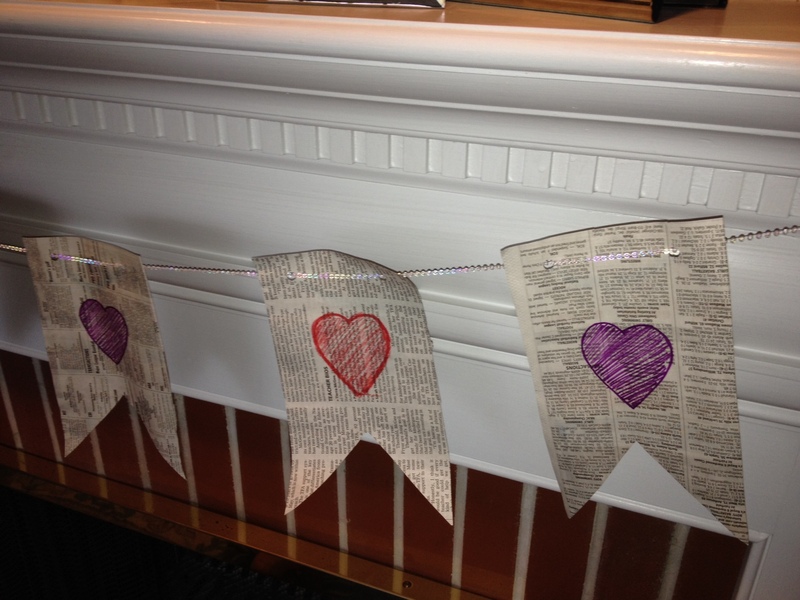 I had a few colors to chose from and ended up choosing the red crayon and magenta marker for the colors of the hearts. 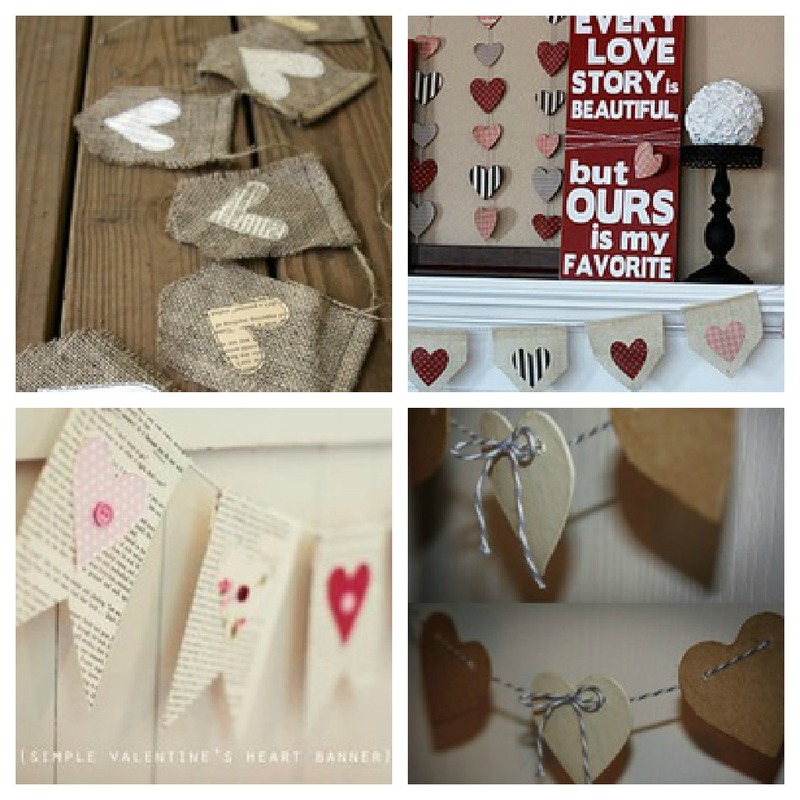 I layed the banner on the floor and used a cookie cutter to make some perfect hearts. I thought the exact same heart might make the banner a little nicer. Have I mentioned how easy this was? Time to hang it up. Cute right? I was please with how this little thing turned out. I thought the pearls were a great compliment to the paper. 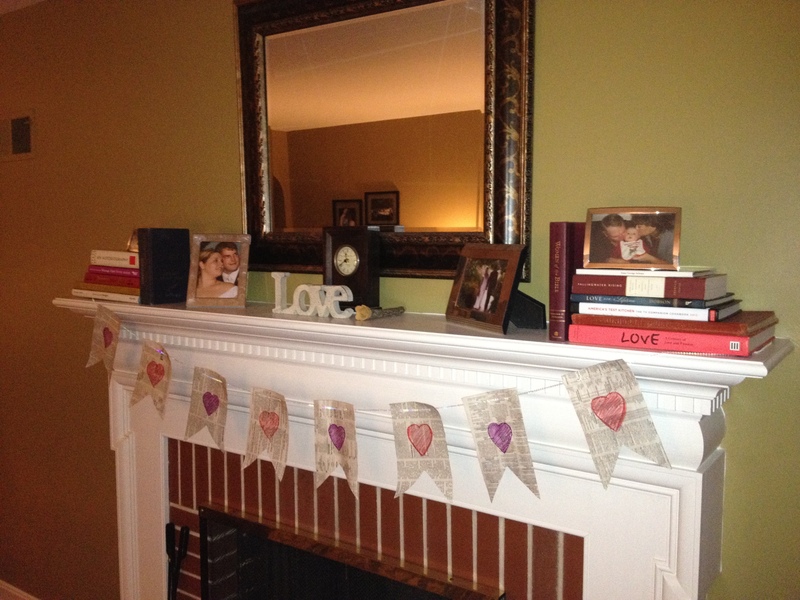 The colors on the hearts blended well with the other decor in the living room. 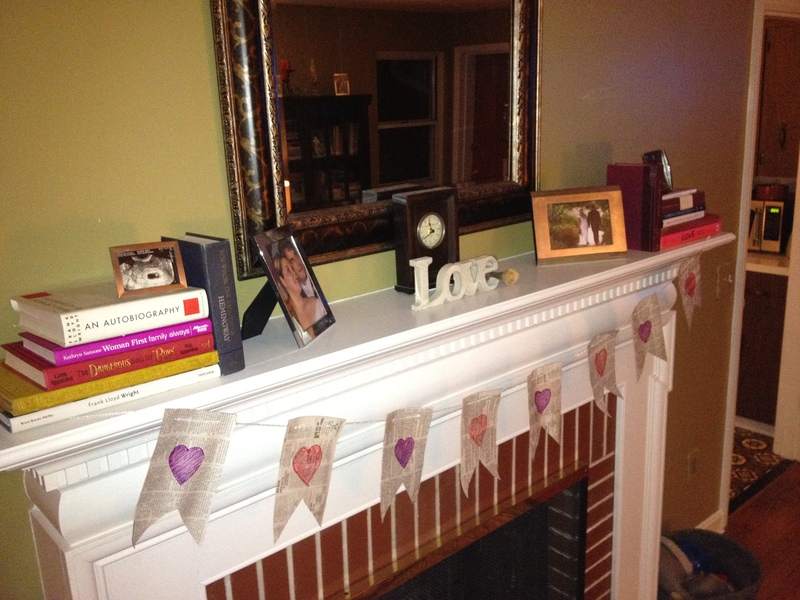 I placed a few colorful books on the mantel to help the colors stand out. 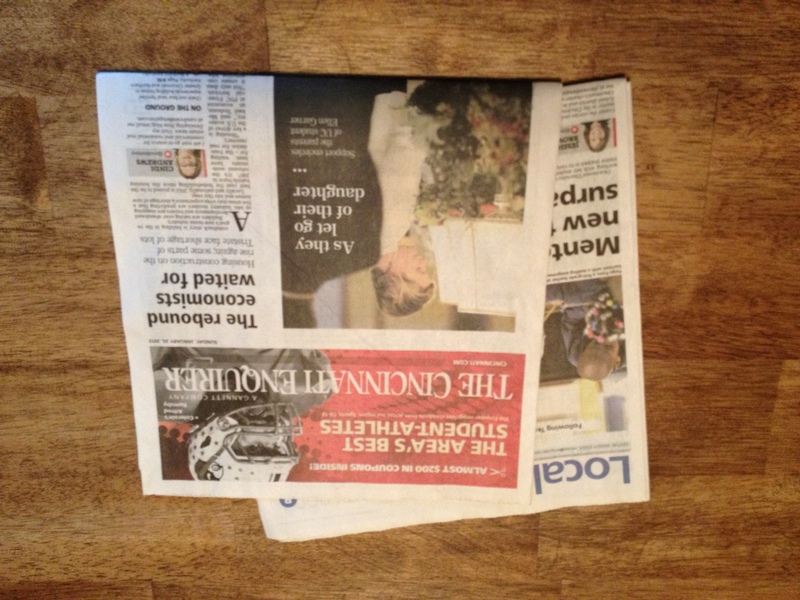 I liked it and thought I would use the newspaper in a couple other frames that were empty. Why not? This large frame is in our living room and needs our latest family pics. I added a simple love quote. True. 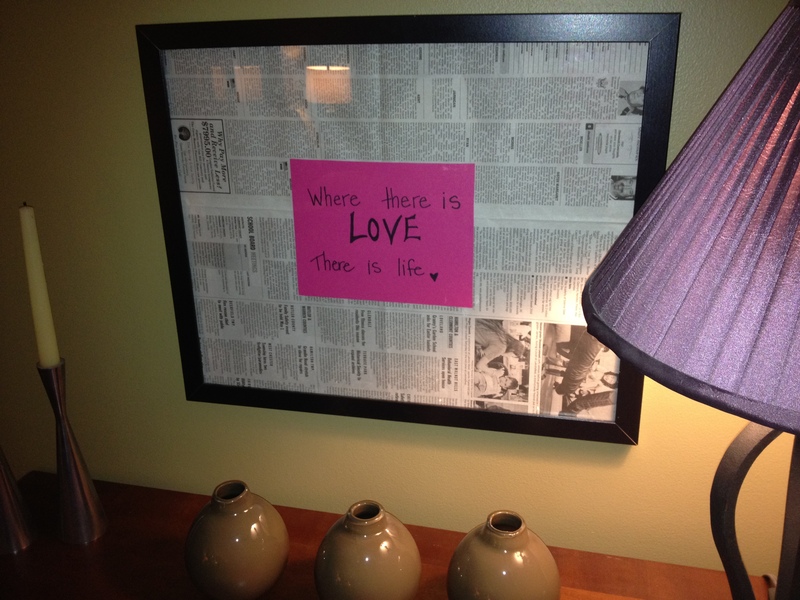 And, in our kitchen I used my crayon and marker again to draw an XO on newspaper in put in this frame. There sits my pineapple and hiding in the back is my next DIY adventure #photobomb. So excited about that one. And since we are talking decor, here is some decor that I already had, so that was free to. 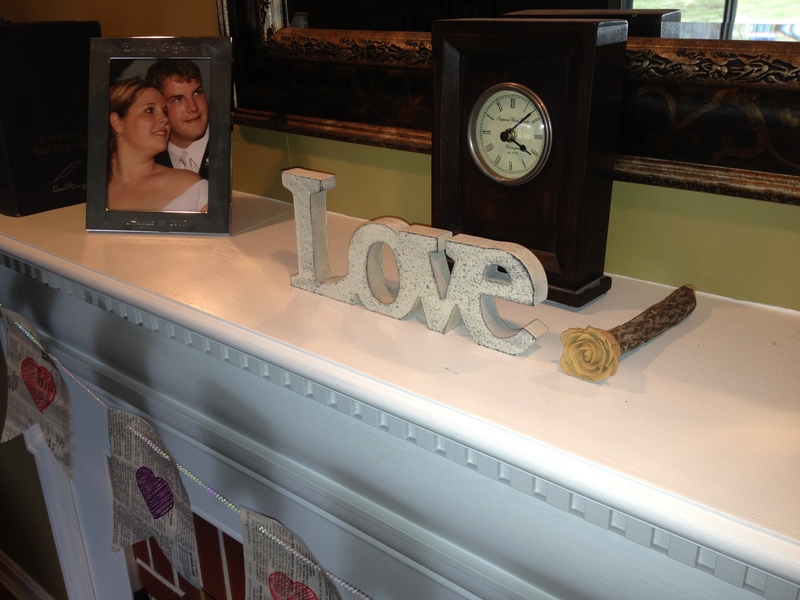 This “love” sign I found at TJMaxx a few years back for $.70! That has to be the cheapest item I have ever bought there. 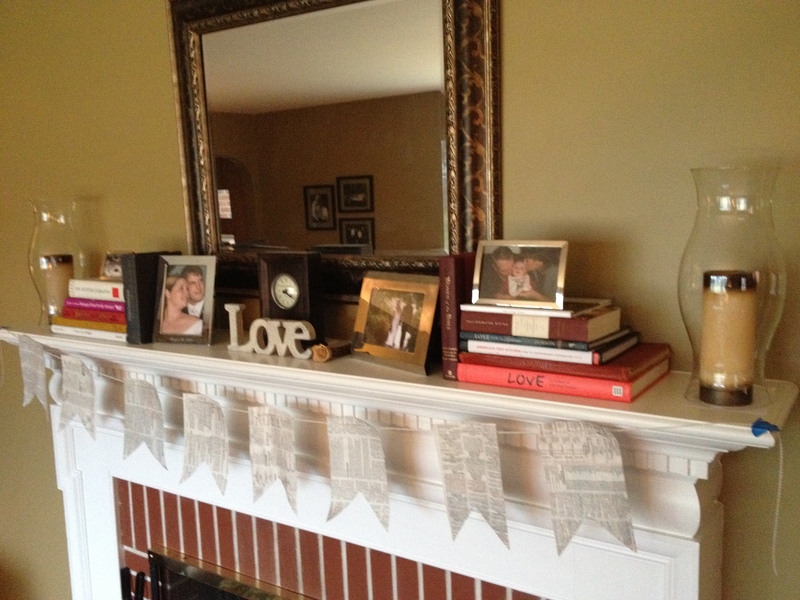 In the dining room, some fabric from Isaac’s weekly pictures sits under a glass heart-shaped bowl. 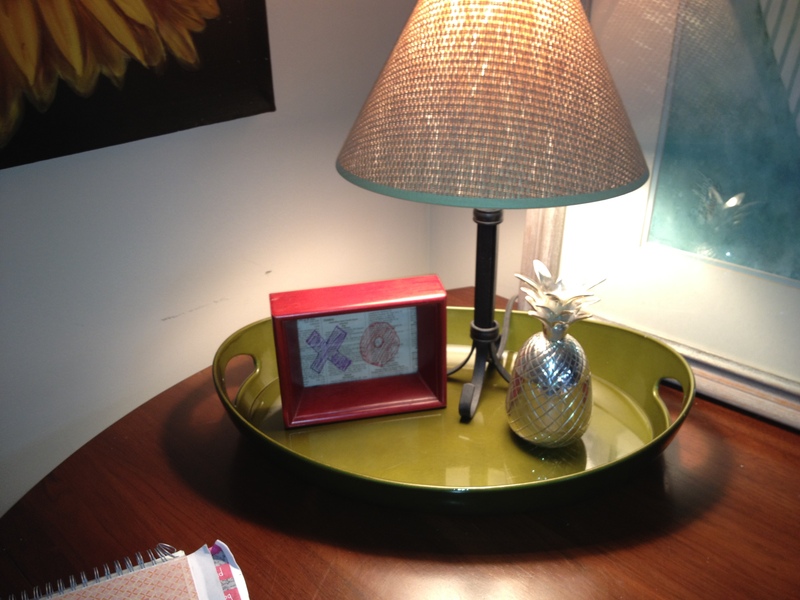 I’ve had the bowl for years; it was also a TJMaxx find. 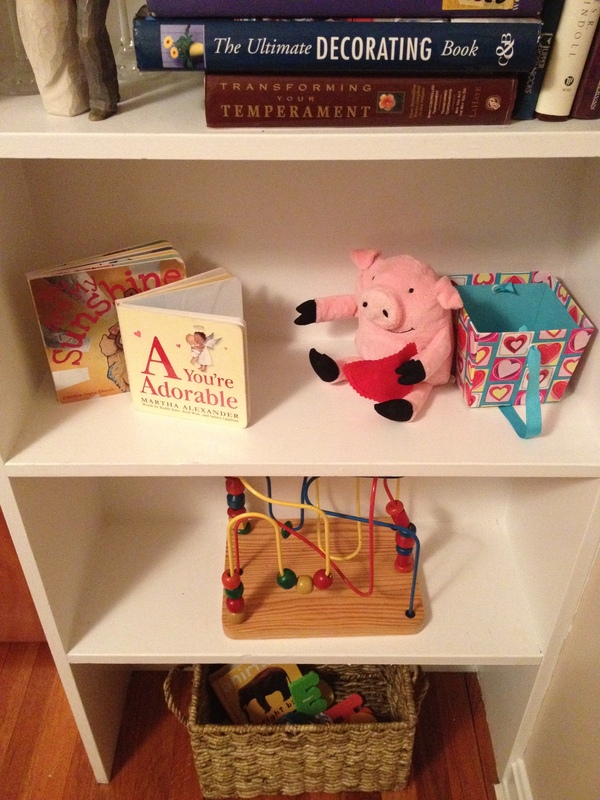 On the bookshelf in this room are some items that I let Isaac get his hands on. He likes to carry the pig around and hug him saying “Awww”. I guess I say that when he hugs me. The “A You’re Adorable” book was a gift from his Philly friends. He LOVES this book, I actually can quote it form memory and I recite it to him in tune. We are more festive this Valentine week than we ever have been before. Lots of love to celebrate I guess. And, I have to admit I LOVE my banner. It is cute and it was free! Double win for sure. What are you DIYing for Valentine’s Day? 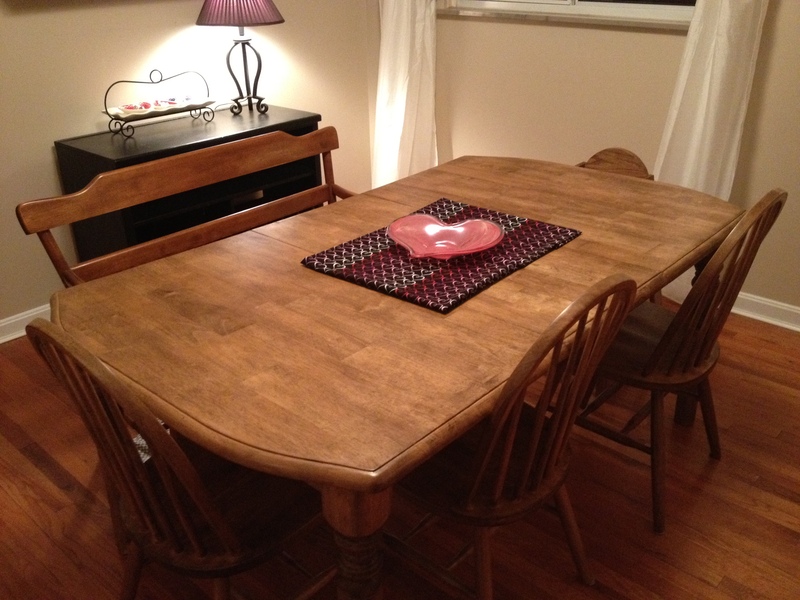 This entry was posted in deals, diy, home decor on February 10, 2013 by projectmomma. Adorbs! 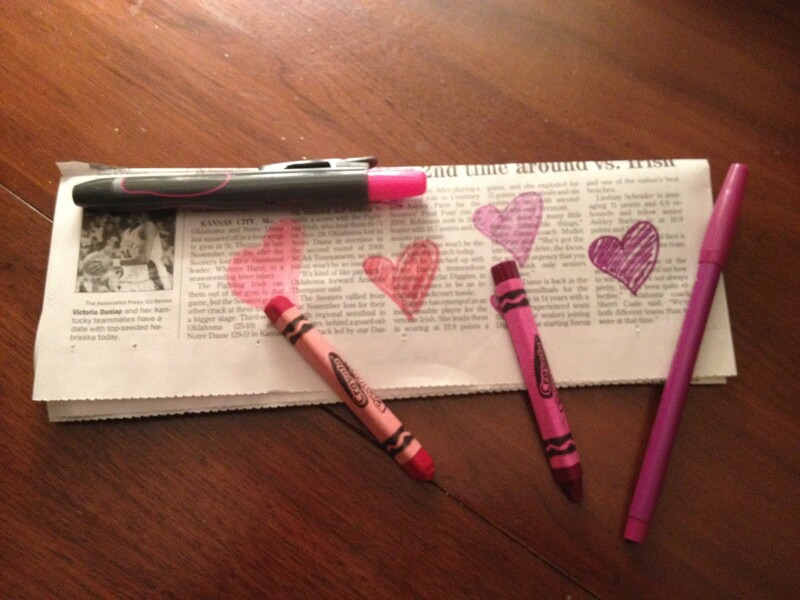 Crayon and newspaper can be art, or in this case, decor. Fantastic answers to the challenge! Thanks Kristiana. Yes, super simple and still cute. I need more ideas like this. Unfortunately I did not even hang it this Valentine’s day as I was in the hospital with baby #2. Next year!!! Oh, and thanks for reading.